When cellular phones emerged in the 1980’s wireline phone service was excellent. Penetration was at 99 percent in the United States and prices had never been cheaper. The industry was deregulated and phone companies were competing fiercely over long distance calling plans. In contrast, the new cellular phones were not “good enough” on the basis of what was considered necessary for making critically important phone calls. Sound quality was poor, coverage was spotty and battery life measured in minutes. But they allowed a whole new consumption model of communication to emerge. They allowed a caller to call a person not just a place. Over time, this simple value proposition caused a powerful profit formula to emerge. That formula led to extremely rapid improvement in the quality of the network and devices that connected to it. It caused such a cataclysmic change that twenty years hence it became possible (even natural) for consumers to “cut the cord” and abandon wireline communications altogether. The “excellent quality” wireline industry was dead to be replaced by the “good enough” wireless industry. 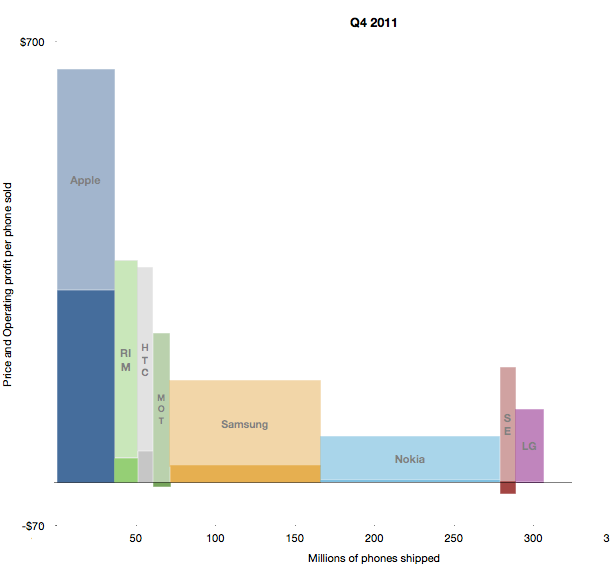 One consequence of mobile telephony was increased consumption. Voice call minutes increased dramatically because calling could happen anytime from any place. While overall consumption increased, landline use decreased. Then came messaging of various types. Forms of communication enabled by cellular networks that simply did not exist before with landlines. As a result there were vast pools of profits available to telcos that seemed to appear out of nowhere. SMS and data plan income was beyond anyone’s ability to forecast in the 1980s. 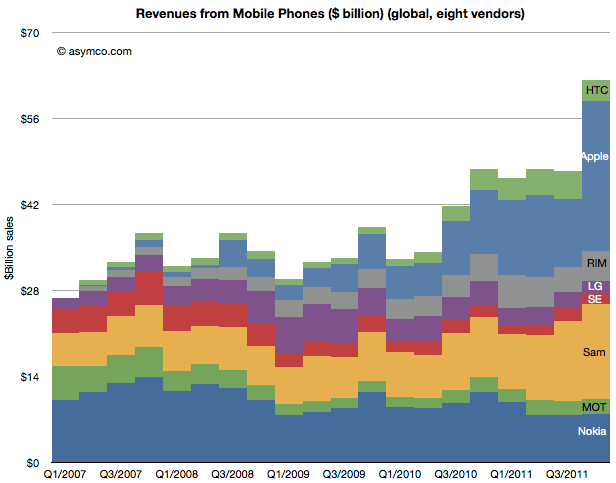 The same phenomenon is happening with smartphones. 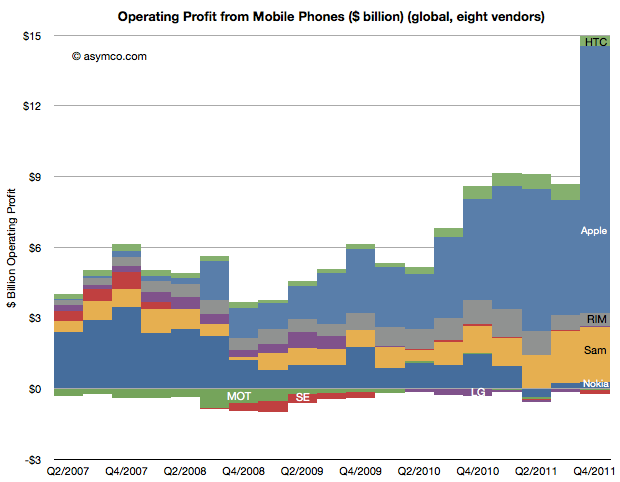 Consider a proxy measure: operating profits from mobile phones since the iPhone launched, illustrated below. 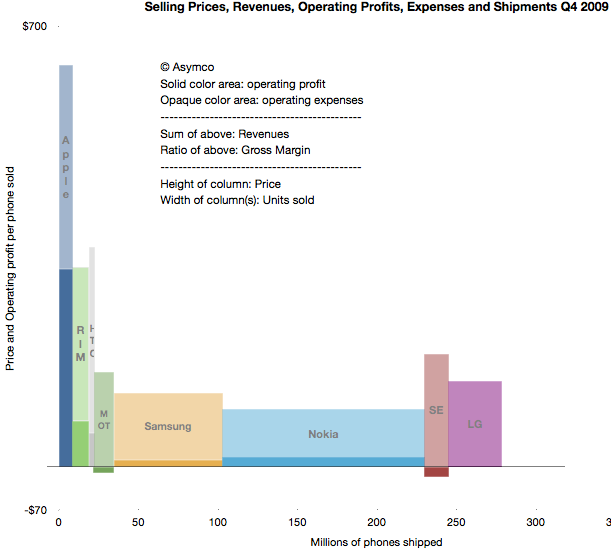 Another way to visualize the evolution of the market is to look at the combined price, profit margin and volume areas for the fourth quarters of 2009, 2010 and 2011. These charts illustrate that there is no “law of conservation of profits” in any market as long as there is sufficient innovation. This is because the there is no “law of conservation of value created”. If value is presented, buyers will gladly trade cash for it. Conversely, if there is no value-generating innovation, growth stops and competition reduces to a zero-sum game. One of the most exciting aspects of disruptive growth is that although it tends to transfer profits from incumbents to entrants, it also grows the size of the overall market. Sometimes the growth is significant. 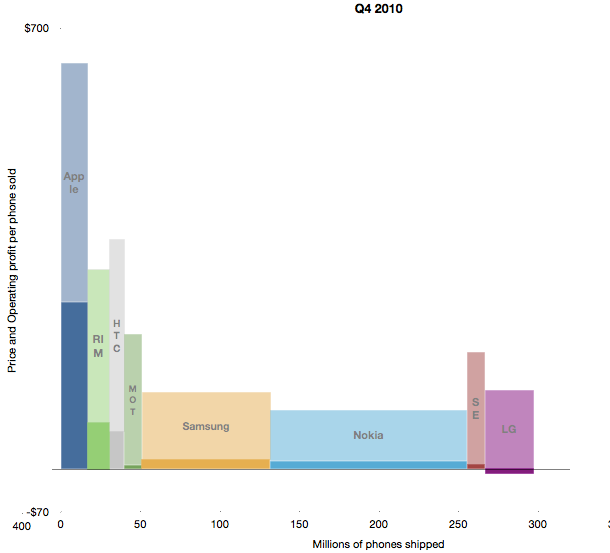 › Next Post When will tablets outsell traditional PCs?